POF, Plenty of Fish, does well in the sea of internet dating. Their strategy seems to be keeping the site totally free for users, although there are upgrades you can purchase optimize the service, optimized with an orange pop on POF’s site. Free worms get 14 million a potential bites per day! That’s right, you want to be a worm? There’s POF! 1/14,000,000 is a very hopeful probability that someone will be in your locale, and a 5 category checklist for your chemistry. Smarter matching of relationships is the edge that throws POF above something slap and dash like Tinder. Calling it Chemistry, POF takes 5 aspects of Self and analyzes them compared to other people. The magic potion recipe remains a family secret. These are great first date topics to cover, by the way. 1 Self-Confidence – Do we believe in ourselves outwardly and hide our insecurity in similar closets? Or do we live in the closets and could we live there together? Peas in a pod. 2 Family Orientation – Do you want kids? Yes or No. Don’t keep that secret, please. 3 Self-Control – Are you going to control yourself or should I do it for you? 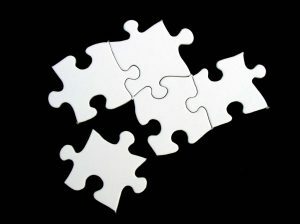 Puzzle pieces, innie and outies, positive and negative space. 4 Social Dependancy / Openness – Do we want friends or you want to be my one and only homosapian? 5 Easy goingness – Is it going to be hard to date you because you are softer than me? Is it going to be hard to date you because you are rigid and cut my softness? We aren’t knives, people. Watch out! How deep does the fishing hole go these days? Match.com, Ok Cupid, And Tinder have created a dating ocean with POF! At one time it was plenty impressive that one man was taking on the online dating world. Strong-armed founder Markus Frind is written about fondly in Business Insider, and back in the old days of 2007 POF by Forbes. It seems like Plenty of Fish has reached the point of a giant incestuous ocean. Just like Kelly Clay says POF has had a million babies born because of it. Now, that’s just a sort of zestimate. It might be time for the little guy to climb into the hot seat. Maybe the SingleSocialNetwork? Keep the pool clean guys, keep it clean. Click to Join POF if your down with deep oceans with Plenty of Fish.